Your ModKit contains items and you selected a The Nightmare Before Christmas Halloween ModKit. 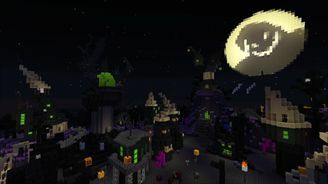 Come play along in the Nightmare Before Christmas map! It contains some of our spookiest mods. Check out creepy mobs from EnderZoo and Nightmare Creatures. Then build your own scary mobs using Necromancy! Dabble with witchcraft and magic from Witchery and Minegika 3, but watch out for demons!